For most of my life I didn’t really get the Psalms. I mean, sure, I’d memorized the first Psalm in Vacation Bible School. And I’ve both given and received Psalm 23 during difficult times. And yes, it is true that when my mother caught me tying my little brother to a chair because he’d stolen my Micro Machines, she had me sit and pen Psalm 133:1 (“Look how good and how pleasant it is when brothers live together in unity!”) a thousand times while he was off playing with said Micro Machines . But apart from such moments, I’ve struggled to understand their purpose. 1) The Psalms are poetic. The same is true for faith without the Psalms. The poetry of the Psalms lifts their imbedded truths past our walls of skepticism and doubt. Because the route to the human heart is paved with poetry. It vaults love and hope into corners of our hearts untouched by narrative or legal language. And so the Psalmists wrote some of the most intricate poems known to man. Unfortunately, many of their intricacies are lost in translation. Psalm 119, for instance, is an acrostic in the Hebrew: each stanza features the subsequent letter of the Hebrew alphabet, thus creating a visual appeal that has yet to be reciprocated in English form. But even when unaware of such intricacies, we can and should absorb the truth behind the words on the page. Read slowly. Breathe deeply. Meditate on every line of every page. Because the Psalms speak to our soul, heal our wounds, uplift our spirits and breathe life into the heart of faith in ways unattainable with the use of other forms. 2) The Psalms address every human condition. The Psalmists are the schizo-popstars of the Bible. To such an extent, in fact, that today modern psychological experts have posited the writers may have had depressive and mood disorders themselves. Not unlike the marvelous minds of Emily Dickinson or T.S. Eliot. Most of us are prone to divide our life between the professional and personal and then assign acceptable emotions to each. CEO’s don’t apologize, men don’t cry, spouses should only feel butterflies of love, and children must obey. This leads us to a worldview in which God is either real and good (thus, only a recipient of praise). Or, perhaps, he just doesn’t exist at all. But the Psalmists do not see life as compartmentalized; they do not draw lines between hope and despair, happiness and anger, bloodlust and love. They embrace the messy roller-coaster of life because they write from it’s murky depths and euphoric highs. And so the Psalms teach us that God is one who is able and willing to love us whatever our current state. They tell us that God redeems our shame (Psalm 51), hears our despair (Psalm 22), blesses our labor (Psalm 127), protects us in oppression (Psalm 7), grants us discernment (Psalm 1), controls our world (Psalm 9) eases our anxiety (Psalm 46) and even holds us in our homesickness and longing (Psalm 128). The Psalms ride the pendulum of human emotions and, in doing so, testify that ours is a God who rides these ups and downs with and for us. 3) Jesus lived the Psalms. If you’re ever thumbing through your Bible and ask yourself the question “What would Jesus read (WWJR)?” The answer is: the Psalms. Of course, Jesus knew his Torah and engaged the writings of the Prophets; but Jesus lived the Psalms. Throughout the Synoptic and John’s gospel, the Psalms appear over 25 times either as direct quotations of Christ or as allusions by the authors. Jesus prayed with the Psalms. He and his disciples meditated and worship with the Psalms. And, as such, Christ’s ministry reflected the heartbeat of a loving, just, and merciful God. This in stark contrast to the deeds of the Pharisees, men who obviously knew Leviticus but the tenderness of Psalm 119 was lost to on their hardened hearts. The Psalms pop up, more than any other part of his life, in Jesus’s final days and death. He referenced a Psalm in foreshadowing his own betrayal (Psalm 41:9 in John 13:18). Following the Last Supper, Jesus and his disciples sang the Hallel (or ‘praise’) Psalms of 113-118. Then they went to Gethsemane. Two gospel accounts record Christ quoting the Psalms in his final moments on the cross (Psalm 22:1 in Matthew 27:46 & Psalm 31:5 in John 19:30). The point is that Jesus’ ministry and mission were both soaked in the lifeblood of the Psalms. Consequentially, the pathway of discipleship is also paved with the Psalter. So we should probably read them. 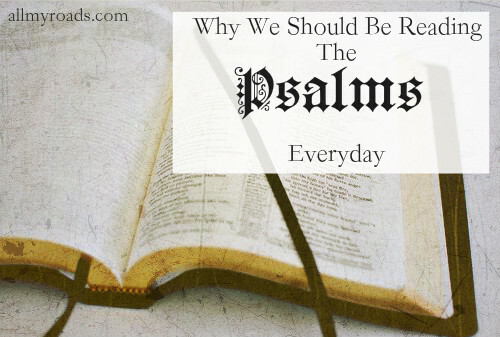 If you read five Psalms a day you’ll cover most of the Psalter in a single month. And many Psalms take less than a minute to read. If you engage in this exercise 11 months out of the year (one month for catch-up) you can cover the entire Psalter over 500 times in the average adult lifespan. Because the Psalms take us by the hand and lead us down trails of existence, over bridges of wonder and through valleys of despair. They guide us up winding paths toward a destination which, for now, is hidden in a cloud. And the fog of life is thick; it’s easy to lose our way. But the Psalms point the heart heavenward; they guide us through the fog, up the mountain and beyond the realm of human comprehension. They carry us into a world of transcendence, a miraculous place where only the subject of sacred poetry could possibly dwell. The Psalms guide us every day; every moment, every breath, they take us one more closer to the moment when the clouds will clear and we see the Wonder of Wonders face to face.